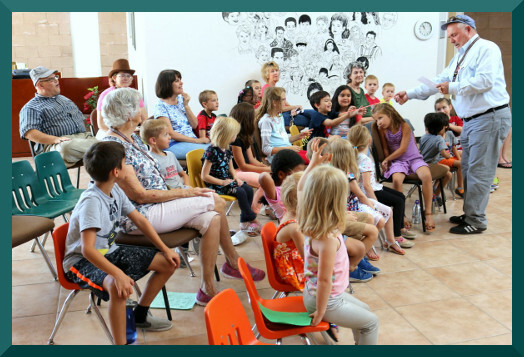 We held a Vacation Bible School at Sahuaro Baptist Church in Tucson, Arizona from July 15 – 20, 2018. Pastor Kester opened each day with flag and Bible pledges and songs that promoted our theme for the week. The children worked hard on the memory verses as Jane taught them the motions and several different ways to memorize verses. 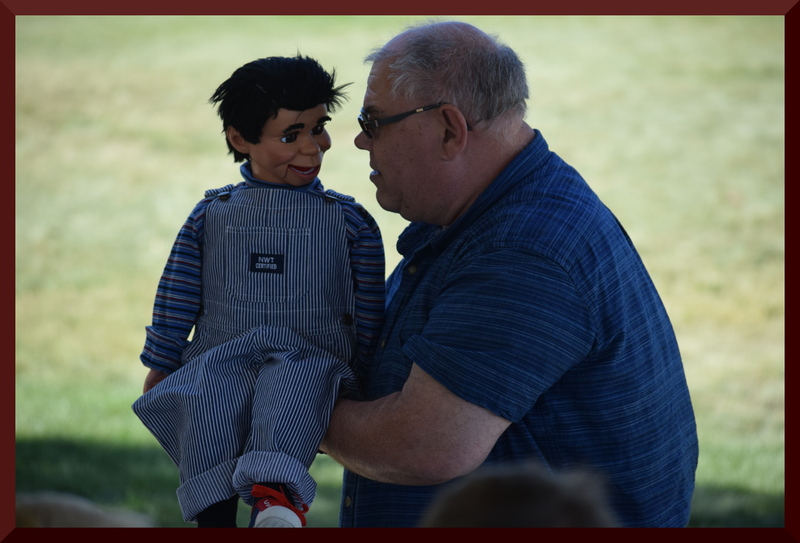 Each story was introduced through ventriloquism as the gospel was taught through object lessons with a surprise ending. We rejoice in the three children that responded to the gospel and trusted in Christ as their Savior. Each day the children had homemade cookies and on Friday they ate ice cream bars. The games were filled with action and lots of fun. On Friday, the kids had a water balloon battle and water bombed pastor. Please pray for Sahuaro Baptist Church as they seek to reach this growing community on the southeast side of Tucson, Arizona. We thank them for all their prayers and support for the Silcott Ministries. 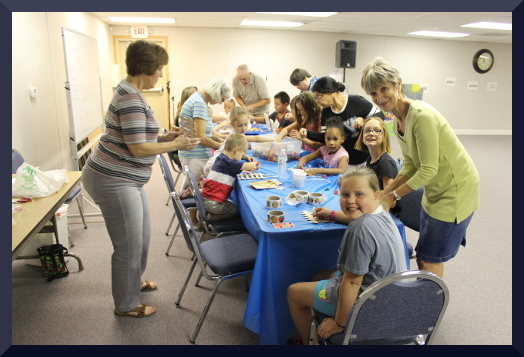 From July 8 – 13, 2018, we held a Vacation Bible School at Southeast Valley Bible Church, one of our supporting churches in Gilbert, Arizona. The week was very hot with haboobs (dust storms) and humid thunderstorms each evening. Yet the children and the teenage helpers from the youth group were faithful each day. The children enjoyed singing using lots of motions to keep them active. We enjoyed coming to the church early so that we could spend the 4th of July with our dear friends Gary and Jennifer Davis. We loved the fireworks displayed over a local school a few miles from the church. Please pray for Southeast Valley Bible Church as they seek to reach this growing community with the gospel. Calvary Baptist Church in Kingman, Arizona did not have a pastor, so I called them to let them know that I was available to hold a Vacation Bible school the week of June 24 – 29, 2018. The church invited us to come during the week for VBS and preach for both Sundays before and after the week. While we were there Clinton Morris of Arkansas accepted the call to become their new pastor. One of the ladies in the church was returning from the Philippines and had children in the Philippines draw a sign for our VBS in Kingman. 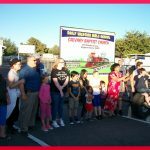 We posted the sign and invited the community to send their children to our Vacation Bible School “On Track for Christ”. We trusted the Lord to send us children. After the week was over we had an average of 9 children a day and one child trusted Christ as her Savior. Please pray for Calvary Baptist Church in Kingman, Arizona as they follow up with these new families. The church owns the lot behind the church, so we were able to park with full hook-ups: water, fifty-amp electricity, and a sewer system set up for a mobile home. Fifty amps is important when you are facing temperatures in the hundreds in desert conditions. Our three air conditioners barely keep up during the hottest part of the day. 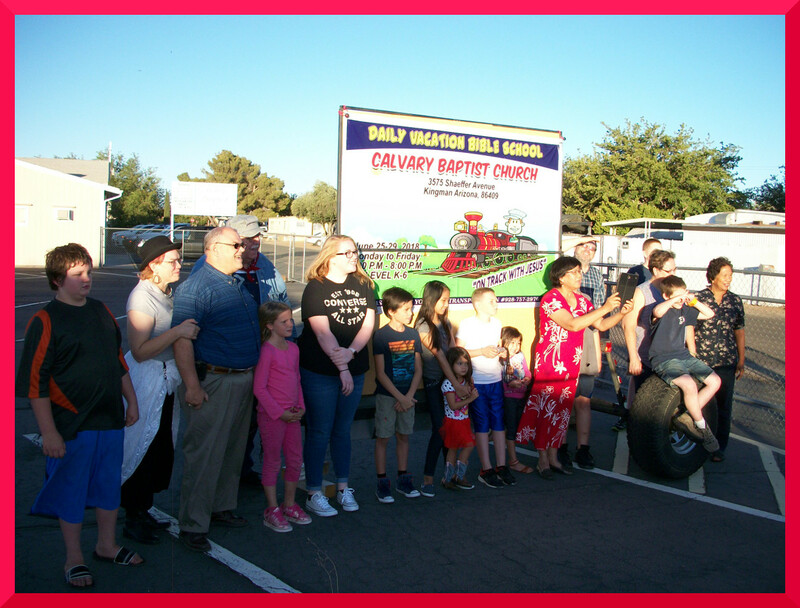 Our next Vacation Bible School was held in Gilbert, Arizona at Elliot Road Baptist Church with Pastor Dan Mooney. 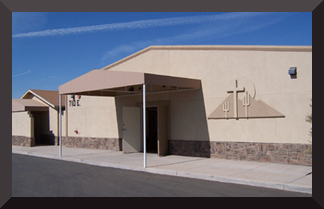 Elliot Road Baptist Church is one of our supporting churches in the state of Arizona. The church does not have very many children, so the goal was to reach out into the community for some new contacts. We had around 12 children with visitors each day and three trusted Christ as their Savior. Jane taught the children the verses using songs and motions. One of the girls trusted Christ as her Savior on Monday and came back each day bringing a new friend with her for points. On Friday the friend she brought also trusted Christ as his Savior. He came back in the auditorium with a new Bible in his hand and a smile on his face. A New Name Written Down in Glory. Please pray for those who trusted in Christ as Savior and for the church as they seek to reach these families for Christ. 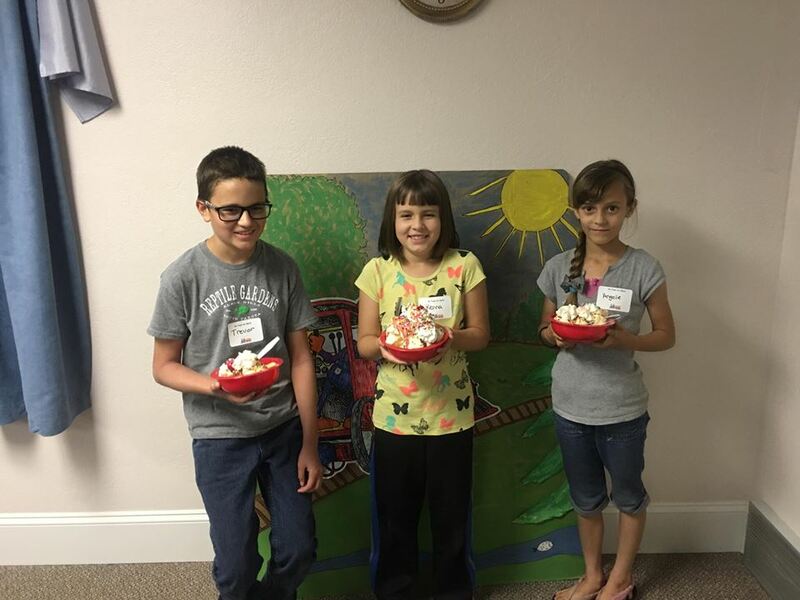 Vacation Bible School in Prescott Valley was held on June 10 – 15 at Open Door Baptist Church with Pastor Thomas Petro. Pastor Petro and I first met at Faith Baptist Bible College in Ankeny, Iowa. It was a blessing to see Pastor Tom again and his wife Brenda as we served the Lord together in a week of VBS. 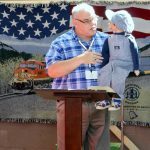 Silcott Ministries presented our theme “On Track for Christ” with Bible stories told through ventriloquism and the gospel clearly shared through object lessons with a surprise ending. Each day the children worked hard on their memory verses and bringing visitors to join them in the fun. The crafts this week were well thought out giving the children something to take home that would remind them of the Bible stories told during the week. On the last day they drew a name of one of the children who could throw a pie in Pastor Petro’s face. The children lined up to watch the fun. Please pray for the six children who trusted in Christ as their personal Savior. Also pray for us as we replace one of our air conditioners that quit working in this hot summer weather. 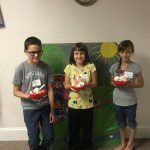 The week of June 3 – 7th, 2018, we held our first Vacation Bible School in Santaquin, Utah. Santaquin sits in a valley with one mountain range to the west and one to the east: both ranges run from north to south. A local park where both ranges can be clearly seen is where the VBS was held, because this new work meets in a small rented office building and because about 30 children attended each day. Not meeting in the church also encouraged mothers from the local polygamist colony of Rocky Ridge to allow their children to attend. Please pray for these dear children as they seek the truth about God and eternal life. Pray also for Pastor DeMorell and his wife Rachel who is about to give birth to their first baby boy. We are so thankful for our small car which allowed us to drive back and forth from Nephi where our motorhome was parked at a RV park. Praise the Lord the store front church – First Baptist Church of Nephi is finishing the final phases of the construction of their church building. They have been a store front church for 20 years. 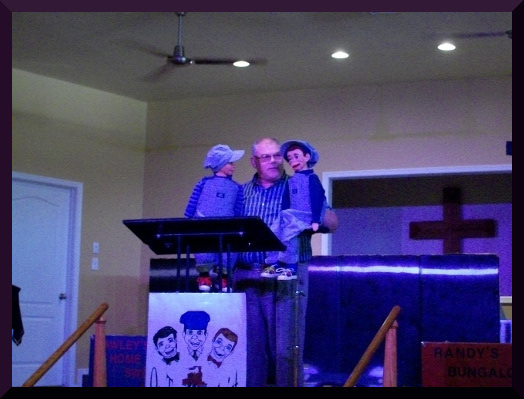 We started August 26 on Saturday night in Cokeville with hamburgers and hot dogs on the grill followed by ventriloquism, an object lesson, and a singspiration. Pastor Hartman and Pastor Sprecher of Thayne are trying to start a new church in Cokeville which is halfway between the two communities. These pastors are conducting a Bible study each week to grow a group of believers. Then August 27 – 30 we were at Grace Baptist Church in Kemmerer, Wyoming with Pastor Richard Hartman. We treated the meetings as a whole family Vacation Bible School and I preached every night using ventriloquism and object lessons. Each service was well attended by members, visitors and friends from the community. Please pray for those who heard the gospel but have not responded by faith in Christ. During the week Jane was able to spend time with quilting friends that live in town. She finished several quilts with their long arm quilting machine which helps make the job much faster. Jane even stayed back in Kemmerer as I traveled to Douglas, Wyoming so she could spend a couple more days with friends. 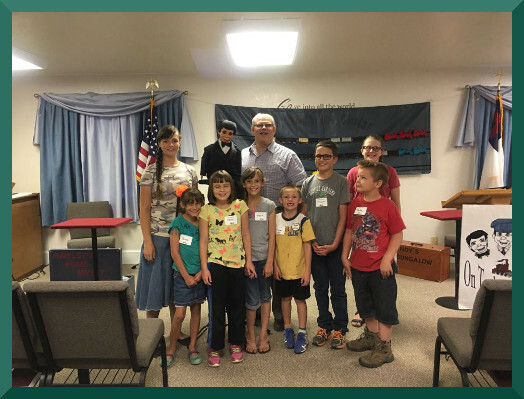 In Thayne, Wyoming at Friendship Baptist Church, we held an evening Vacation Bible School with Pastor Jay Sprecher. One of the church members had a friend from work bring his son on Monday night for DVBS. We are praying that he will come to church with the rest of his family. One of the boys brought his brother to VBS so that he could get double visitor points. 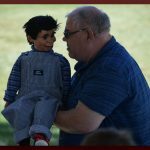 The children enjoyed the ventriloquism each day and worked hard on their Bible verses learning the motions and songs for the daily points. For an incentive to learn the verses and work on their daily work sheets they would earn an ice cream sundae on Friday night. They would get one scoop for 1500 points; two scoops for 2500 points; and three scoops for 3500 points. The one that had the most points for the week would win a bowl heaping full of ice cream with a banana, whipped cream, and a cherry on the top. During the week people in the church helped me work on our driver side mirror which was falling off the motor home. The bolts holding the mirror were stripped out and slowly getting very loose. Being in a secluded area with no one close by to fix my problem, I looked for people in the church who could help me. Each night after VBS church members helped me remove the mirror and look for solutions to fix the problem. By Thursday night we got the mirror back up on the motorhome and fully secured. Thanks to J.D. Fulbright and others in the church we are safe to go back on the road. Please pray for Friendship Baptist Church as they seek to reach this community for Christ. 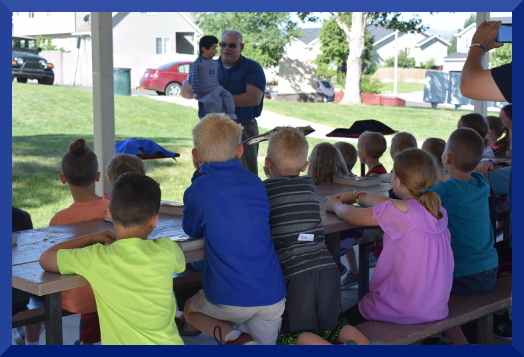 August 6 – 11, 2017 we held a Daily Vacation Bible School in Lander, Wyoming. Pastor Timothy Senter and his wife Chris run a day care center in the back of the church. Each day we had children from the day care and others that came from town; they worked hard on their memory verses and worksheets after the daily story from God’s Word. Tickets were given out for rewards after saying verses or bringing friends, their Bible or completed worksheet. For three tickets they picked one prize from the treasure chest. It was a joy to see them work hard to earn three tickets each day. Some even had up to 12 tickets in one day. We did not see any decisions for salvation, but the seed was sown and the dry fields watered with a clear presentation of the gospel. Please pray for decisions in the future as pastor and the church family continue to seek to reach Lander for the Lord Jesus Christ. Also pray for their need to replace a laptop that was stolen from the church during the week that we were there. For a praise, we thank pastor’s son, Sean Senter for helping us repair our stove and a slide out step that covers the entry way in our motorhome. 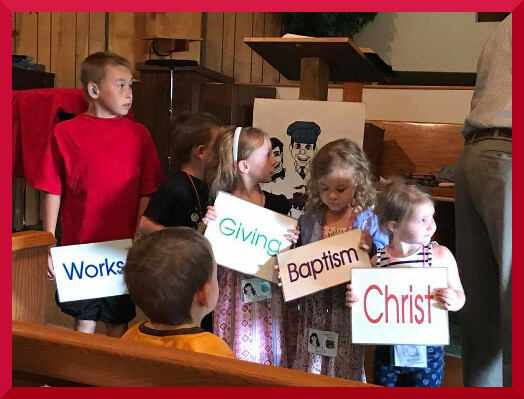 Because the closing program for Faith Baptist Church in Iowa City was on Sunday, July 23, we started our VBS In Cannon Falls, Minnesota on Tuesday, July 25. 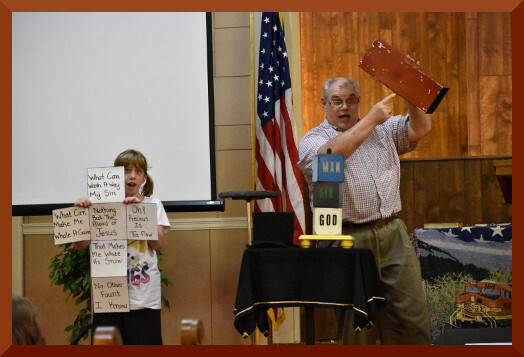 We presented our VBS “On Track for Christ” Tuesday – Sunday. Each night the children worked hard to memorize the verses using motions and singing the verses which I led while Jane playing the piano. Each night we started at 6:00 pm and went through to 7:30. We started by singing the theme song and songs that Pastor Brad Berglund had taught the children in the past. 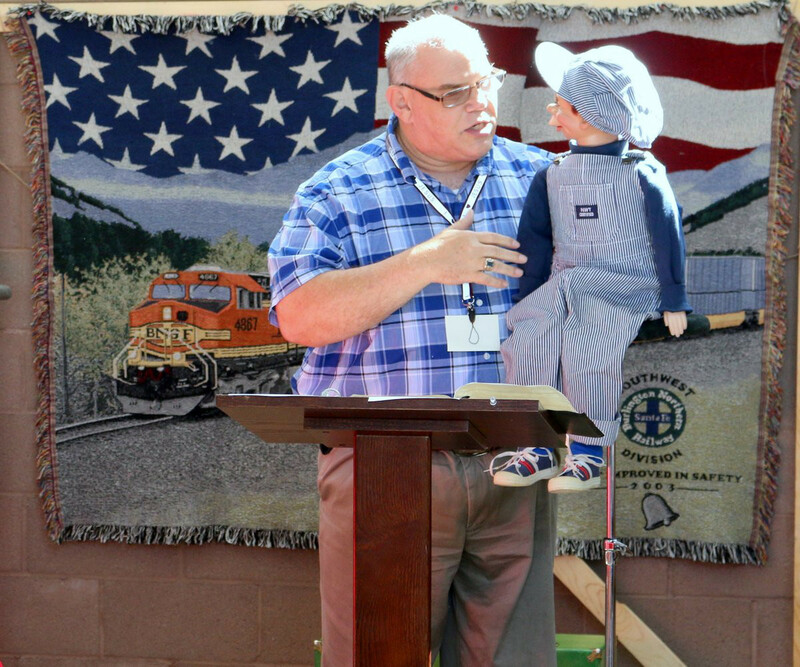 I presented the gospel through ventriloquism and object lessons from 6:10 to 6:40. From 6:40 to 6:50 Jane taught the verses using motions and music to help the children remember the verses to quote them for their teacher. From 6:50 to 7:15 the children played game time and ate a quick treat of cookies and crackers. The closing included a big candy grab for each verse that they memorized and info for the next day. We closed our week of VBS on Sunday night and had parents of the VBS children. Sunday morning, I preached to a full church and saw several new families and friends that we have known for several years. We enjoyed seeing the church family and spending time each day with Pastor Brad and Linda Berglund. Please pray for this growing church and for the children who heard the gospel and have not trust Christ as Savior. You are currently browsing the archives for the DVBS category.